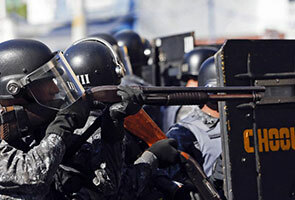 CURITIBA: Police fired rubber bullets and arrested 11 people Monday to break up anti-World Cup protesters who trashed banks and blocked traffic in the southeast Brazilian host city of Curitiba. About 200 protesters gathered in the city center and marched toward the stadium where Iran played Nigeria in a World Cup match, but were blocked by police, news website G1 reported. The protesters stopped a bus carrying fans to the stadium and blocked off several streets, setting garbage on fire to prevent cars from getting through, G1 said. The rally then broke up, but a small group of masked protesters returned to the city center and began storming banks until police fired rubber bullets to disperse them. In the northeastern city of Natal, where the United States were playing Ghana, around 300 activists staged a protest against World Cup spending and a visit by US Vice President Joe Biden, in town to watch the match at the start of a four-country Latin American tour. A group of protesters briefly blocked a street but the rally broke up without violence, G1 reported. Brazil was hit by a wave of protests in the year leading up to the World Cup, sparked by an economic slowdown, accusations of corruption and the record $11-billion budget for the tournament, which critics said should have been spent on urgent needs in health, education and transport. But the movement has lost momentum and recent protests have been far smaller than a year ago, when a million people took to the streets during the Confederations Cup, a World Cup dress rehearsal.